Tony Santillan does not have any MLB stats for the season. Draft: 2015, Cincinnati Reds, 2nd rd. Last name is pronounced SAN-tee-yan...entered the 2019 season rated by both Baseball America and MLB Pipeline the fifth-best prospect in the organization and 69th in BA's Top 100...also was rated by field managers the best pitching prospect in the Florida State League and by Baseball America the sixth-best overall prospect in the Southern League...in 2018 was the Reds' Minor League Pitcher of the Year and their Pitcher of the Month for April and July...was an All-Star in each of the last 3 seasons at 3 different levels (Pioneer League in 2016, Midwest League in 2017, Florida State League in 2018)...following the 2017 season, his changeup was rated by Baseball America the best in the organization...following the 2016 season, his fastball was rated by Baseball America the best in the organization...in November 2018 participated in a leadership training program at West Point. Graduated from Seguin High School in Arlington, Texas. Was the Reds' Minor League Pitcher of the Year, their Pitcher of the Month for April and July and a Florida State League All-Star...in 26 starts at Class A Daytona and Class AA Pensacola went 10-7, 3.08 (149ip, 146h, 38bb, 134k)...among all Reds minor league pitchers ranked second in ERA, T3rd in wins and fourth in strikeouts. 2017: At Class A Dayton was a Midwest League All-Star...ranked among MWL leaders in opponents' batting average (.222, 3rd), strikeouts (128, 4th) and ERA (3.38, 5th)...following the season his changeup was rated the best in the organization...2016: Following the season was rated by Baseball America (11th) and MLB.com (14th) among the organization's top prospects...his fastball was rated the best in the organization. 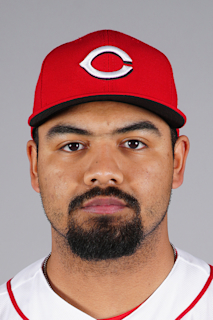 January 9, 2019 Cincinnati Reds invited non-roster RHP Tony Santillan to spring training. July 5, 2018 Tony Santillan assigned to Pensacola Blue Wahoos from Daytona Tortugas. April 4, 2018 RHP Tony Santillan assigned to Daytona Tortugas from Dayton Dragons. June 9, 2017 Dayton Dragons activated RHP Tony Santillan from the 7-day disabled list. May 31, 2017 Dayton Dragons placed RHP Tony Santillan on the 7-day disabled list retroactive to May 30, 2017. July 27, 2016 RHP Tony Santillan assigned to Dayton Dragons from Billings Mustangs. June 16, 2016 RHP Antonio Santillan assigned to Billings Mustangs from AZL Reds. June 24, 2015 Cincinnati Reds signed RHP Antonio Santillan. June 24, 2015 RHP Antonio Santillan assigned to AZL Reds.